The theme of the 2013 Oklahoma FFA Convention to be held April 30th through May 1, 2013 is “FFA, Grow Like That!” There are thousands of former FFA members that serve as role models for current and future FFA students- and the Radio Oklahoma Ag Network and OklahomaFarmReport.Com is pleased to be working with the Oklahoma FFA Association to spotlight some of the tremendously successful men and women who wore the Blue and Gold Jacket of the FFA during their high school days- and have used that experience as a springboard to success in later life. Another of those former FFA members who have distinguished themselves following their FFA experiences is Monica Wilke. 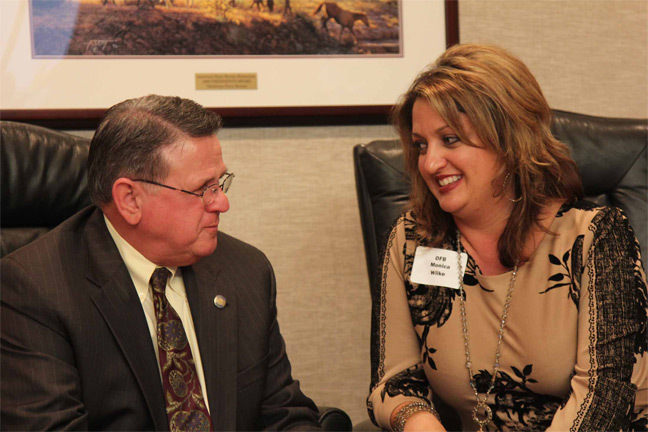 Wilke is the Executive Director of the Oklahoma Farm Bureau. Wilke is an Oklahoma native and said she was first drawn to FFA for what many people can see from the outside-livestock judging. It was only then, she says, that a different and deeper world opened itself to her. “Like most children in rural Oklahoma, I was very excited about turning nine years old so that I could purchase my first livestock project and go through the process of showing and grooming that animal for show. That was my initial interest into the FFA. Wilke would go on to become a state FFA officer. Wilke said those crucial FFA experiences became a foundation that stayed with her as she moved past her high school years and into college. Wilke said that her accomplishments in the business world as an executive of a major farm organization have never been framed in a gender-based manner. She said that the opportunities she experienced in FFA were wide open regardless of whether one was male or female. The Oklahoma Farm Bureau has been a tremendous supporter of 4-H and FFA over the years. Wilke says that commitment continues and she sees it as an investment not just in terms of economic impact, but, more importantly, in terms of personal development for all involved. “We’re not just investing, you know we talk about the impact the livestock show has, for instance, on Oklahoma City, it’s significant, but the thing that I think is a bigger impact is the investment in human capital in the future leaders of tomorrow that as an executive when I look out and want to hire individuals to come to work for us, I’m looking at young people coming out of the FFA. Ron Hays talks with Monica Wilke about her life-changing experiences in FFA.